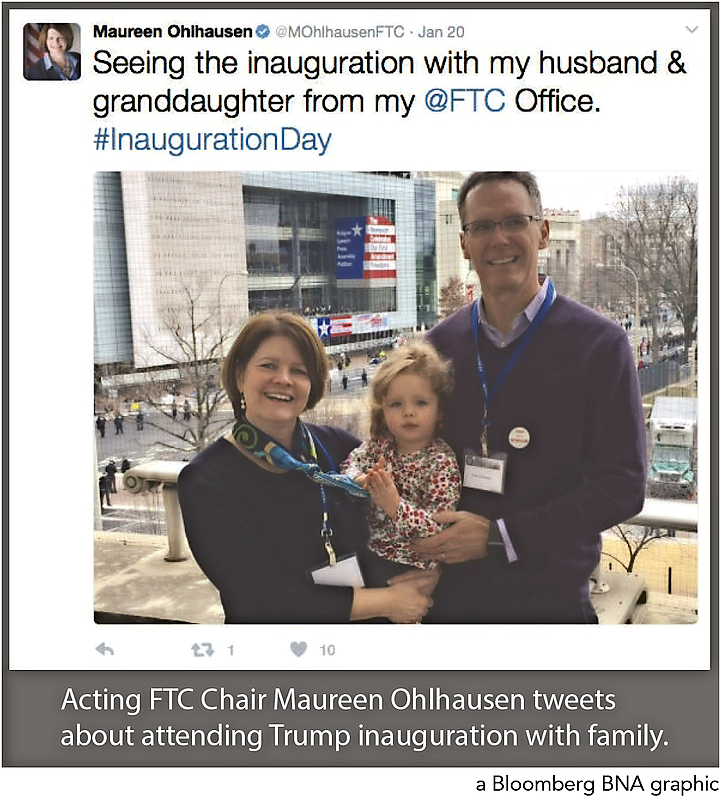 Acting Federal Trade Commission Chairwoman Maureen Ohlhausen has been speaking and tweeting a lot about her vision for the agency under President Donald Trump -- a sign to some observers that she may be auditioning for a long-term leadership role. While she’s viewed in some Washington circles as an ideal choice, it’s unclear how much the White House agrees. For some time, Ohlhausen has been saying privately that she’s interested in chairing the FTC on a long-term basis, sources with knowledge of the matter told Bloomberg BNA. Now that she’s acting chairwoman, history does not bode well for her. None of the FTC’s four previous acting chiefs were made permanent. Utah Attorney General Sean Reyes is rumored to be a top contender for the job. Last year, Reyes called on the FTC to reopen an antitrust investigation of Google Inc.
“His appointment might be encouraging to people who want to see stronger antitrust enforcement than you’d normally expect in a Republican administration,” Seth Bloom, an antitrust attorney at Bloom Strategic Counsel LLC in Washington, told Bloomberg BNA. Reyes, a Republican, was a Trump supporter during the campaign season. Picking Reyes to chair the FTC would be one way for Trump to deliver on his promise to “drain the swamp” in Washington, according to Carl Hittinger, an antitrust lawyer at Baker & Hostetler LLP. “I think Trump is looking, in many of his appointments, for people who are new and different, who will bring a fresh outlook to the position,” he told Bloomberg BNA. A Reyes appointment would complicate an already cloudy outlook for the FTC. Agency watchers contacted by Bloomberg BNA said they know very little about him, beyond his call for a Google probe. Trump too has been viewed as a wild card on FTC enforcement issues. During his campaign, he signaled that he might be tough on mega-mergers, but his transition team has included conservative antitrust advisers, such as Joshua Wright, a George Mason University law professor and former Republican commissioner at the FTC. With Olhausen, Trump would be getting a well-respected commission veteran, who favors “regulatory humility” and appears anxious to move forward with a traditional Republican agenda. In outlining a path forward for the FTC under the new administration, she has ramped up her criticism of Democrats. She highlighted her opposition to the FTC’s anti-monopoly lawsuit against Qualcomm Inc., filed on Jan. 17. Her dissent in that case blasted Democrats for taking action against the company without economic and evidentiary support, on the eve of a new presidential administration. During a Feb. 2 American Bar Association conference in Atlanta, Ohlhausen discussed “near-term” consumer protection changes she envisioned in her new role as acting chairwoman, which was announced on Jan. 25. Her plans included making sure that enforcement actions address “concrete consumer injury.” She noted her objection to the FTC’s 2015 consent order settling privacy charges against Nomi Technologies. Ohlhausen has also been active on Twitter. Just a day before Trump’s inauguration, for example, she launched a “tweet storm” that rehashed a number of her Obama-era dissents. “She might be making herself a bit more visible because she’s interested in becoming chair,” said Christopher Sagers, a Cleveland State University professor whose focus includes economics and antitrust law. Moves such as Ohlhausen’s tweet storm serve to remind the Trump administration that she has consistently charted her own conservative path, according to Calkins. “She does seem to be campaigning for a permanent appointment,” Calkins said, adding that it doesn’t appear to be the likely outcome at this point, given what has happened with previous acting chiefs. “On the other hand, who knows? Maybe she’ll pull it off,” he said. Bilal Sayyed, a partner at McDermott Will & Emery, said he wouldn’t read too much into Trump’s decision to make Ohlhausen an acting, instead of permanent, chairwoman. “There’s a lot going on, so maybe it just made sense to do it that way,” Sayyed said. Ohlhausen has received a strong endorsement from former Ohio Secretary of State Ken Blackwell, who served as a senior domestic policy adviser on Trump’s transition team. The president “took a step in the right direction by naming current commissioner Maureen Ohlhausen as the acting chair, but it is time to cement her leadership by naming her the permanent chair – which many leading conservatives have advocated,” Blackwell said in a Feb. 12 blog post published by American Thinker, a conservative online newsletter. Making Ohlhausen’s position permanent would be a key step in the administration’s effort to roll back regulation and encourage innovation, according to Blackwell, who sits on the board of directors at the Club for Growth, a free market advocacy group in Washington. Ohlhausen is one of only two sitting FTC commissioners. She’s joined by Terrell McSweeny, a Democrat. Three commission seats are vacant. Calkins said Olhausen is a smart commissioner who cares deeply about the FTC and would do a “fine job” if given the chance to remain at the helm. She would likely lead the agency in a more conservative direction, although not as aggressively as someone like Wright, he said. In contrast with the FTC, the Federal Communications Commission already has a permanent leader. Trump very quickly gave that job to Republican Ajit Pai, who had served as a FCC commissioner under Obama. Pai, in many ways, went much further than Olhausen in taking on the previous administration, Calkins said. However, it’s unclear how much that may have played a role in the White House’s decision-making, he said. Whether or not Ohlhausen’s appointment becomes permanent, her recent comments provide an important foundation for the commission going forward, according to Sayyed. “I think emphasizing where she disagreed with the Obama administration not only signals what she would do, but it shows what she thinks is a good path for a Republican majority,” he said.